Olive Ann Burns was born on July 17, 1924 in Banks County, Georgia. Her family farmed but during The Great Depression, they had to sell the farm. They moved to Commerce, Georgia when Burns was about 8 years old. From these modest beginnings, Burn went onto college and then a career with The Atlanta Journal. She wrote an advice column for The Atlanta Journal Magazine as Amy Larkin until 1967. Cold Sassy Tree is her only completed novel. She was diagnosed with lymphoma in 1975. This diagnosis prompted her to write a novel. Though always a writer, fiction was not a direction she thought she would ever take. She had always had an interest in family history and had been recording family stories from her mother, who died from cancer in 1972. After her mother's death, Burns relied on her father for these recollections. She drew from these stories when writing Cold Sassy Tree. It took her more than 8 years to write Cold Sassy Tree, which was published in 1984 by Boston publisher Ticknor & Fields (who eventually became Houghton, Mifflin and Company). The book was well received by readers and many wrote to Burns asking for a sequel. She was still working on the sequel when she died on July 4, 1990. The incomplete manuscript Leaving Cold Sassy, along with her notes, was published posthumously. On July 5, 1906, scandal erupts in the small town of Cold Sassy, Georgia. E. Rucker Blakeslee elopes with Miss Love Simpson. Why is this so scandalous? Perhaps because Blakeslee buried his first wife barely 3 weeks ago. Or perhaps it is because Miss Simpson is half his age. But perhaps the most scandalous part is that Miss Simpson is a Yankee. As the gossip swirls, Will Tweedy's life and the sleepy town of Cold Sassy are never the same again. 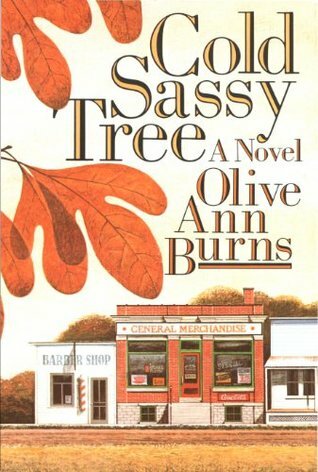 Cold Sassy Tree is set in the fictional town of Cold Sassy in the early 1900s. Cold Sassy is modeled on Burns's own hometown of Commerce. A few of the characters are based, at least somewhat, on members of Burns's family. The main plot, the widower marrying 3 weeks after the death of his wife, is based on a story she was told about her grandfather who did actually marry only 3 short weeks after the death of his wife. Will Tweedy is the 14-year-old narrator of the story and is based on Burns's own father. As a novel for adults, it is unique in having a child narrate the story. Death is a prominent theme in the novel. The story begins with the death of Will's grandmother and ends with the death of his grandfather. In between, Will's Uncle Camp commits suicide. Will learns that though sadness is a part of death, great happiness can also result. We see this through Rucker finding love with Miss Simpson and his Aunt Loma following a dream. Change is another theme of the story. There is a focus on modernization in the book. It is portrayed in both a positive and negative light. Indoor plumbing, electricity, and other modern conveniences are heralded. Cold Sassy is a railroad town, but the growing prominence of automobile causes the town to make changes. At one point they have to widen the area around the tracks to make a roadway for the cars. This requires them to cut down the tree for which the town is named. Nostalgia causes great sadness. Physical change is not the only way this theme is explored, but also in beliefs and thinking. There is racism and closed-mindedness in the town of Cold Sassy. These beliefs and distrust of anyone different were not uncommon in small towns, especially in the south, at the turn of the century. In some areas, it was still prevalent in the 1980s and 90s. The Cold Sassy tree is a symbol of the old ways and it being cut down symbolizes the need to make way for progress. Until I started researching the book for this post I did not realize it had been made into a TV movie in 1989 starring Faye Dunaway and Richard Widmark, Neil Patrick Harris played Will Tweedy. It apparently wasn't very good. One reviewer at IMDB.com stated, "The movie is about as far off from the book as you can possibly get." Another reviewer comments, "Suffice it to say that Olive Ann Burns would roll over in her grave if she knew the way her fabulous book had been butchered." If you really want to watch it, you can buy it on VHS (yes, that's correct it hasn't even been converted to DVD) at Amazon. In 2000, it was adapted as an opera by composer Carlisle Floyd. I only vaguely remember reading Cold Sassy Tree and the sequel Leaving Cold Sassy. I have never been a fan of southern fiction, but as the former was assigned reading but the latter was not I have to wonder if the story resonated with me. I was a Yankee is a small town. I lived in the same county as Commerce when this story was published. Though I didn't read it until about 10 years after it published, I was still living that county. I actually was living in a town much closer to Commerce and often shopped there. I experienced distrust and the feeling of being an outcast just because I wasn't born and raised in the area. I had a boy in eighth grade tell me during Georgia History class that he hated me because my side won the war. I do remember liking the historical aspects of the novel. "Cold Sassy Tree is the undeniably entertaining and extraordinarily moving account of small-town Southern life in a bygone era. Brimming with characters who are wise and loony, unimpeachably pious and deliciously irreverent, Olive Ann Burns’s classic bestseller is a timeless, funny, and resplendent treasure." Have you read Cold Sassy Tree? I think it's great that you support local authors (even this one that you read 25 years ago). I've been trying to think of ways that I can do that more too.